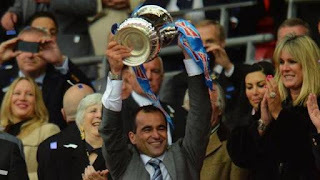 On the face of it, winning the World Cup seems a very different challenge to negotiating a successful FA Cup campaign but, as Belgium boss Roberto Martinez explains, there are actually several similarities. No manager has ever won both competitions, but Martinez will attempt to become the first this summer when he leads the highly rated Red Devils in Russia. And part of his plan involves the same combination of strategy and psychology that saw him steer Wigan to a famous victory over Manchester City in the 2013 FA Cup final. Martinez joins Gary Lineker, Alan Shearer and Joleon Lescott in the BBC studio at the DW Stadium on Monday, as the Latics look to upset the runaway Premier League leaders again in a rematch of that tie. In a wide-ranging interview, the Spaniard discusses that Wembley win, why it is so good to work with City's Belgium playmaker Kevin de Bruyne, and how Romelu Lukaku's first season at Manchester United has been the making of him.